Wastewater from hydraulic fracturing of oil and gas wells in California is heavily contaminated with a toxic stew of chemicals known to cause cancer or reproductive harm, an analysis by Environmental Working Group shows. Because California is the only state to require comprehensive chemical testing of drilling wastes and public disclosure of the results, the findings also provide a unique window into what chemicals likely contaminate fracking wastewater nationwide. In 2014, the first year of California’s groundbreaking fracking disclosure program, more than a dozen hazardous chemicals and metals as well as radiation were detected in the wastewater, some at average levels that are hundreds or thousands of times higher than the state’s drinking water standards or public health goals (Table 1). These findings underscore the gravity of recent revelations that the state tolerated illegal injection of billions of gallons of drilling wastewater into thousands of disposal wells that pour into aquifers that potentially could be tapped for drinking water or irrigation. What’s more, the mandated disclosure data on the state’s website is still incomplete and confusing, so Californians cannot be confident that it provides a clear picture of the threat these hazardous substances pose to water supplies. Petroleum chemicals, heavy metals and radioactive elements, plus high levels of dissolved solids, are among the pollutants found in fracking wastewater samples tested under the new disclosure program. (Appendix 1) They include benzene, chromium-6, lead and arsenic – all listed under California’s Proposition 65 as causes of cancer or reproductive harm. Nearly every one of the 293 samples tested contained benzene at levels ranging from twice to more than 7,000 times the state drinking water standard. The wastewater also carried, on average, thousands of times more radioactive radium than the state’s public health goals consider safe, as well as elevated levels of potentially harmful ions such as nitrate and chloride. Fracking wastewater is the mix of chemicals, sand and water that is discharged back to the surface after an oil or gas well is “fracked.” It contains chemicals added to the fracking fluid and possibly naturally occurring contaminants from groundwater in the fracked shale. In 2013, fracking and other oil and gas drilling operations in California produced more than 130 billion gallons of wastewater. Most of it was injected underground for disposal or enhanced oil recovery (USGS, 2014). There are about 50,000 disposal wells in the state. Wastewater that is not injected into a well or recycled typically ends up in a surface disposal pond, known as a sump (USGS, 2014). In July 2014, the state ordered an emergency shutdown of 11 injection wells in Kern County after revelations that the Division of Oil, Gas and Geothermal Resources, in violation of state and federal law, had allowed drillers to inject almost 3 billion gallons of wastewater into disposal wells located in protected aquifers. These are aquifers that could one day be needed for drinking water or irrigation. More than 100 water wells for domestic use and agriculture were within a mile of the 11 wastewater injection wells that were shut down. That turned out to be just the tip of the iceberg. In February 2015, after the U.S. Environmental Protection Agency demanded a response to criticisms dating back to 2011 of the state’s Underground Injection Control program, the oil and gas division reported that it had permitted more than 2,000 injection wells in zones containing potential drinking water to accept oil and gas waste or other fluids in violation of the federal Safe Drinking Water Act. Of those wells, 490 were for disposal of oil and gas wastewater and 1,987 for wastewater or steam used for enhanced oil recovery. The state subsequently tested eight water supply wells near the 11 injection wells that were ordered to shut down. High levels of several contaminants typical of the region were found, but none were specifically linked to drilling activity. The state has planned no additional testing of water supply wells near any of the newly identified injection wells with questionable permits. On Feb. 17, 2015, state legislators dissatisfied with the agency’s response so far introduced Assembly Bill 356 to prohibit approval of any new injection well unless a groundwater monitoring program is implemented with it. On Feb. 17, 2015, state legislators dissatisfied with the agency’s response so far introduced Assembly Bill 356 to prohibit approval of any new injection well unless a groundwater monitoring program is implemented with it. But only two weeks later there was more bad news, as the oil and gas division ordered the closing of 12 more disposal wells in protected aquifers, again in Kern County. The state agency promised EPA that it would no longer allow waste injection into the most vulnerable protected aquifers after October 2015 but said it will take two more years to bring the program into full compliance with federal law. 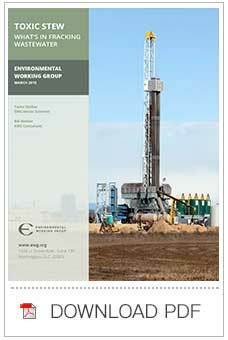 EWG analyzed all available state records of wastewater samples from wells fracked (or treated with another form of well treatment known as acid stimulation) in 2014. California allows drillers to request permission to keep the exact recipe of their fracking fluid off the publicly accessible website, but they must disclose the full chemical composition to the oil and gas division and other agencies. The chemicals in the tested wastewater varied significantly from one drilling company to the next. The records EWG analyzed were submitted under interim regulations; the agency says it will require more complete data beginning in July 2015. As of January 2015, chemical analyses of wastewater from more than 100 fracking jobs completed in early 2014 were incomplete, listed as pending as much as a full year after the wells were fracked. The instructions to drillers for sampling and reporting information need clarification and standardization. Operators are not reporting the correct “source” of recovered fluid from many fracking jobs. The recovered fluid should be specified as both “produced fluid and flowback” in the instructions. Drillers do not have to specify the exact injection well or sump pond where wastewater produced from a job was discarded. If a water supply is contaminated, this information would be key to identifying the company responsible. Allowing injection of toxic wastewater into federally protected drinking water sources for even a limited period is an unacceptable risk to California’s water supply, especially in a time of severe drought. Gov. Jerry Brown should order an immediate halt to the practice even if that means temporarily shutting down oil and gas drilling or fracking in those areas. If drinking water supplies were to be contaminated by wastewater containing the alarmingly high levels of pollutants the testing found, it would be extremely costly or impossible ever to clean them up. It is also unacceptable that the Division plans no further testing of drinking water sources beyond the eight water wells tested in the summer of 2014. The agency should call on the expertise of the California Environmental Protection Agency and State Water Resources Board to test every water source where waste injection has been allowed. In 1983, the federal EPA turned over to the state responsibility for regulating injection wells in California. It is now evident that this was a mistake. For 30 years the state’s Underground Injection Control program allowed practices that endangered drinking water under the aegis of a parent agency that had ignored fracking for decades. The federal EPA has threatened to take back control of the state’s program if California doesn’t do a better job (Baker, 2015). It is long past time for the Division to place public health before oil and gas industry profits.